Plugging a motorcycle tubeless tire is pretty much the same as plugging any tubeless tire from a lawn tractor to a truck. I have plugged many tubeless tires to help folks (including myself) to be able to get home or to a shop. For this writing I will be doing a plug repair to a lawn tractor tire as the situation presented itself. The repair procedure for a motorcycle tire or any tubeless tire would be the same. Once the tire has gone flat, there are a few things that need to be considered. First off, has the tire come off the bead (the portion of the rim the tire seals against)? 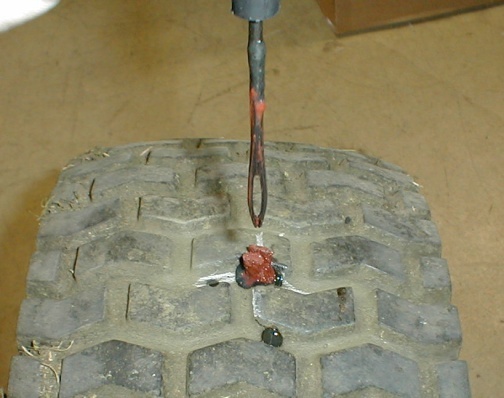 If the bead has been broken, a campsite or roadside repair is out of the question as it will take a large quantity of high pressure air to push the tire back on the bead. 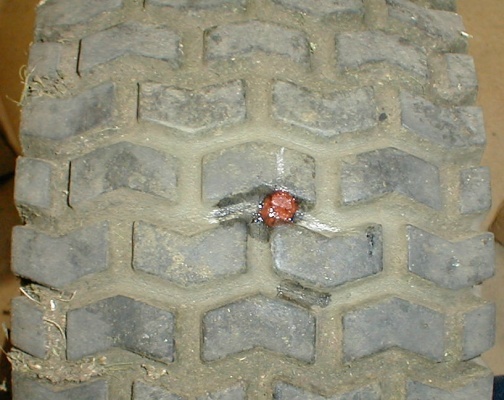 Next off, if the tire has stayed on the bead, the leak or hole needs to be found (usually it's the spot where the nail, screw or other foreign object is poking out of the tire). This is where it has to be decided if the hole can even be repaired. If the hole shows any tearing, it's pretty likely it can't be repaired. If the nail or whatever looks like it went straight in and the bike wasn't ridden too far while flat, then there's a good chance the flat or puncture can be repaired. This flat was caused by a discarded piece of barbed wire. Flat tires can be caused by a multitude of objects, anything from nails and screws to sheet metal parts or even a sharp stick! I usually carry a "Monkey Patch" tire plug kit with me as well as use them at home, so, that's what I will show here (the kit found on new BMWs is different looking but the proceeure is still the same). A photo of the patch kit I usually carry. 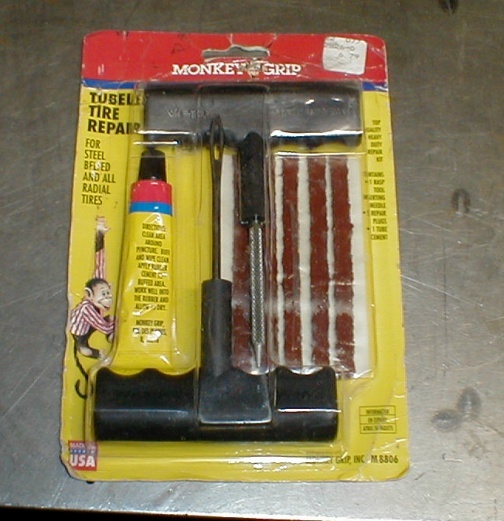 This type of kit can usually be found at any corner auto parts store. 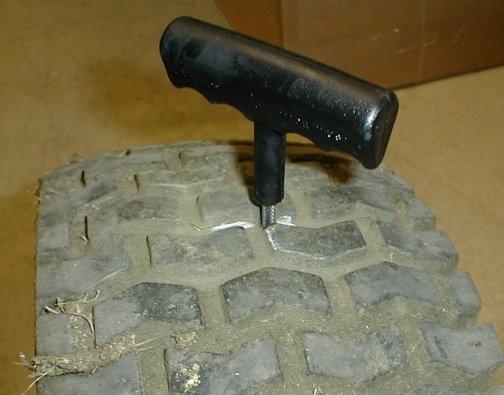 If the nail or foreign object stayed in the tire (which doesn't always happen), mark the location and clean the tire around the object before trying to pull it out (as once the nail or whatever has been pulled out, it's not real easy to see the hole). 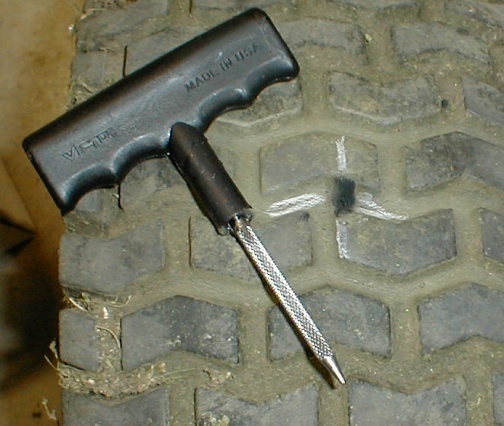 After the tire has been marked, slowly wiggle, twist or pull the object out. Be sure to mark the tire as once the object has been pulled out, it will be a lot harder to see the hole. Tire marked and the object pulled out, now to plug the hole. To get the hole ready for a plug, the "rasp" tool or round file looking tool needs to be pushed into the hole and run up and down a few times. The point of running the tool up and down is to not only clean out the hole but to also to remove any jagged edges (that will be harder to seal) and to make the hole large enough to get the plug into. Running the rasp tool up and down in the hole is an important part of preparing the hole for a plug. The rasp layed out after "rasping" the hole. The second tool or inserting tool (Monkey Grip calls it a needle) now needs to be liberally smeared with the supplied rubber cement. Now the tool or needle has to be pushed into the hole and run up and down a few times to not only lubricate the hole but to also coat the inside of the hole with glue. 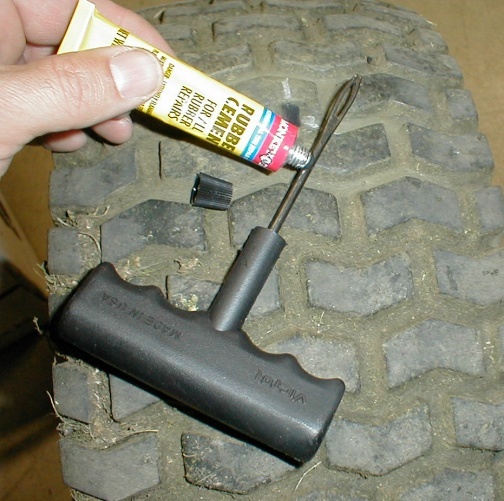 Coating the tool or needle with rubber cement. Remove the tool or needle from the hole and slip one of the plug worms (sealing material) into the end of the tool after removing the backing material (from both sides). Liberally goop up the plug worm with patch glue (rubber cement). Plug worm centered in the tool and being slathered up with glue. Press the tool with liberally gooped up patch worm into the hole. Push the whole works down until about 1/3 of the worm is still showing. With out twisting, pull the inserting tool or needle back out. If all has gone well, the plug worm will stay behind plugging the hole. Tool or needle pulled out and leaving the worm or plug behind. It's a good idea to allow the glue to dry before trying to fill the tire with air. 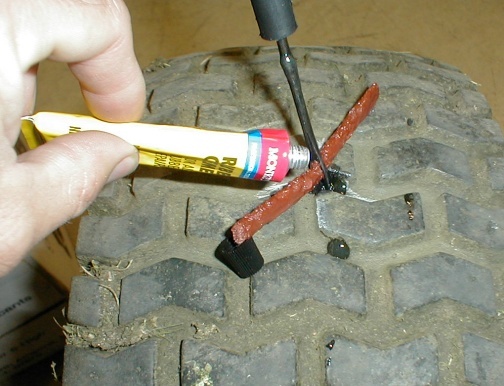 To help speed things up a bit, trim off the excess worm or plug down to tread level and wipe the glue from the tire. Trim off the excess worm or plug material and wipe off any lingering glue. The plugged tire will be ready to be pumped up after waiting about ten minutes to allow the glue to set. If the only source of air is one of those little CO2 inflator kits, expect to use three or four of the CO2 canisters to get enough into the tire to get rolling again. The CO2 kits are not intended to get the tire up to optimum pressure, only to get enough air into the tire to get to a fueling station or other compressed air source. Tire plugged, wiped and ready to go back to work. Here's where the question is posed,.... "Should I keep riding on a plugged tire or should I have the tire replaced?" There are two schools of thought on this, some say "Yes, it's ok to run on a plugged tire." 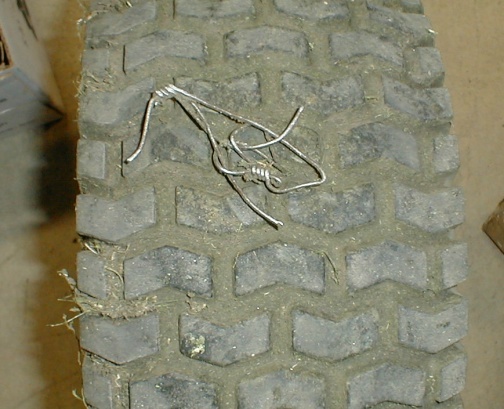 Then others say "No, never run on a plugged tire as the tire has been weakened." This is an area where you will have to decide what is good for you. If the tire has been successfully plugged and you have safely arrived at a shop that can offer help, you could have the tire removed and inspected for internal damage. 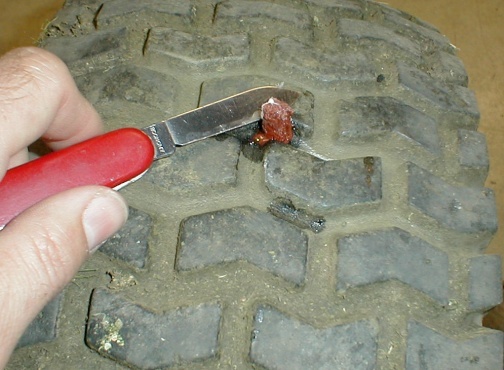 If the nail hasn't tore up the inside of the tire, you may opt to have a "boot" or tire patch put over the hole inside the tire. 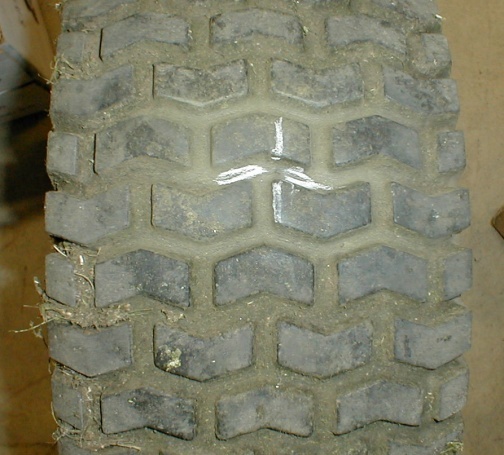 Having a boot fitted to the tire will require the tire to be rebalanced. If the tire already has a lot of wear on it then this would probably be a good time to just have it replaced.